BeoLab 7-4 brings extra authenticity to any film or TV experience. Using the same acoustic lens technology found in BeoLab 5, this compact but powerful speaker is optimised specifically to reproduce the sound of voices. This is essential in a surround sound set-up, as eighty per cent of the voice information goes through the centre channel. Next time you watch a movie, you won’t miss a whisper. In a surround sound setup, BeoLab 7-4 is designed to give a powerful performance in the important centre channel. It can be used with all BeoLab loudspeakers and the BeoLab 2 subwoofer for the ultimate surround sound experience with the BeoVision 7-40 LCD or BeoVision 4 plasma televisions, or a projection screen. Moving with the motorised floor stand of your BeoVision 7, BeoLab 7-4 adds an extra dimension of sound to whatever you are watching on TV. The cabinet is coated in a durable yet silky black lacquer surface. Facing you is a front grill made out of anodised aluminium with a perforated pattern available in five different colours, giving a graphic touch to the overall look. 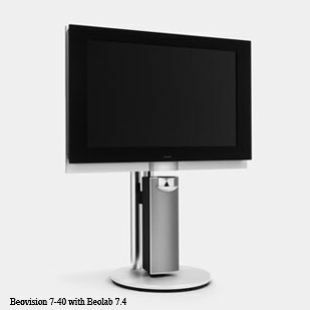 As with all Bang & Olufsen products, there is always a consistency in the design lines, so you will quickly see a coherence between the curved DVD loader on BeoVision 7 and the curved front of BeoLab 7-4. STBbrackets, Bang & Olufsen's preferred supplier for brackets and stands, have made a range of solutions specifically for this model including close fitting wall brackets. Distributed throughout the World by the Bang & Olufsen store network, the STB options add to the diversity of mounting options and positions available.